AMSTERDAM (ISE 2019, Epson Booth #1-H90) – Epson, the number-one selling projector brand worldwide1, today announced a new range of compact, interchangeable-lens Pro L laser projectors. In addition, Epson is introducing new 9,000 and 30,000 lumen laser projectors. Epson’s new projectors will be on display at ISE 2019 in Amsterdam from Feb. 5-8 at Epson’s booth, #1-H90. The new range of Pro L projectors are Epson’s most compact, interchangeable-lens laser projectors. These versatile projectors, complete with 4K enhancement2, HDBaseT and wide lens shift, are designed for large venue usage – from visitor attractions to higher education, museums to corporate meeting rooms. They produce bright (up to 7500 lumens), detailed, high contrast, images with defined shadow details. The minimalist, discreet design and quiet fan noise ensure these new projectors fit seamlessly into a wide variety of environments. 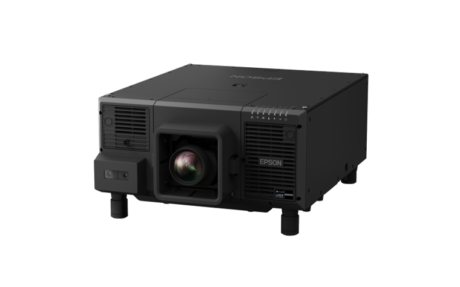 The new 30,000 lumens laser projector, the Epson Pro L30000U, is a high-end installation laser projector. The new 9,000 lumen laser projector joins the successful Pro L1000-Series, which range from 6,000 to 15,000 lumens. These projectors are designed for permanent installations as well as rental and staging. You can experience the latest in Epson projection technology at ISE 2019 in Stand H90, Hall 1.